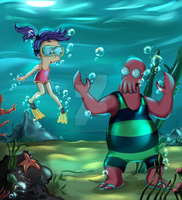 Futurama by ~Darey-Dawn The suggester said: "What can I say? This looks so awesome! The characters looks real! Their expressions are made of win!" My god, this is awesome! aaaaaand creepy looking... but still AWESOME! AHHHHHHHHHHHHHHHH MY EYES CANT CLAW THEM OUT FAST ENOUGH!!!!!!!!!!!!!!!!!! very nicely made. kinda creepy.... but still good work! aaahh...bender. XD We love you the most. Where's The Professor and Amy? Good art, by the way. Interesting. I'm guessing Fry is making that face because he's got Nibbler spit on his ear. This is epic, I love Futurama! This is epic!!! Love the facial expressions! NO. NOW I CANNOT UNSEE IT. My god this is disturbing. "Where is Zoidberg?" Seems to be the most-asked question about this picture....I concur. This really gone Michael Bay to me. El HD no es tan divertido. Though the artwork is stunning, something about it just feels ugly, and makes me not want to look at it. But then, your gallery also features Ronald McDonald sniffing coke, so it's safe to say you're in the habit of putting a cynical twist on the things you create. Perhaps that shines through here, and is what puts me off.